• The Riviera Nayarit CVB and Puerto Vallarta’s Fidetur worked together to attract the ever-growing South American market. The Riviera Nayarit and Puerto Vallarta together undertook a successful promotional campaign in Colombia—the fourth country of origin for international tourism to Mexico—during the Pacific Alliance Summit that took place in that South American country on June 29-30. The joint promotional tour hit Colombia’s main cities, visiting several travel agencies interested in selling the Puerto Vallarta-Riviera Nayarit destination as one of the best alternatives for Colombians seeking to experience different facets of Mexico; they were joined by Aeroméxico and the Colombian office of the Mexico Tourism Board (MTB). Over nine wholesale agencies also participated, as well as hotels from both the Riviera Nayarit and Puerto Vallarta, which shared their latest news and promos as well as the area’s culture, history, activities, gastronomy, its incredible jungle and bay and, of course, its unique and outstanding service and hospitality. 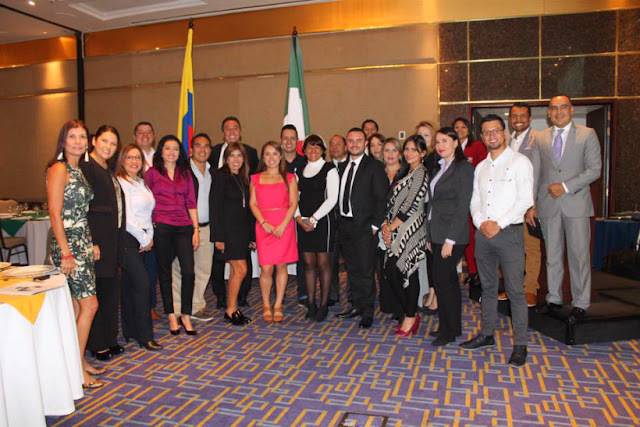 The tour’s first stop was in Bogota on Tuesday, June 27, where they trained over 30 travel and reservations agents in the Price Travel offices. That same day they visited Gallery Travel, an agency focused on groups that wants to diversify its product and has shown a keen interest in selling the destination. Fifteen sales agents were there for the presentation. On Wednesday the 28th the activities continued in Bogota with a destination seminar and a trade show, events that were attended by 105 travel agents. The following day the team headed over to the city of Bucaramanga, where they trained over 67 travel agents. The tour ended its visit on Thursday, June 30th in Medellin, where the team held a workshop with the directors of tourism wholesalers MayorPlus and wholesale operators Luz Verde, where they discussed strategic topics focused on incentivizing sales to both destinations. That evening the destinations hosted a cocktail-presentation where they networked with over 120 travel agents and business partners. The wholesale agencies that participated in this promotional tour were: Solways Colombia, Tureserva.com, CIC Colombia, Turivel Panamericana de Viajes, Pelícanos, Travel Depot BCD Travel, Luz Verde Medellín, MayorPlus Medellín and Akira Travel Medellín. The Riviera Nayarit’s Palladium, Hard Rock Hotel Vallarta, Riu and AM Resorts hotels were also well represented. Several of the country’s top tourism media covered the tour’s activities, among them El Tiempo, the paper with the highest circulation in Colombia; Periódico El Frente, from Bucaramanga; H12Noticias, the main news program for regional channel Teleantioquia; as well as Turismo a Tiempo and the community newspaper Vivir en el Poblado, among others. • According to the Riviera Nayarit’s hotel segment records, in 2013 there were 300 Colombian tourists who arrived in the destination by air. In 2016 the number had risen to over 3,000 visitors, which clearly shows the sustained growth of travelers from this South American country. • As for the ranking of foreign air arrivals to Mexico by country of residence, Colombia is the fourth country of origin for international tourism to Mexico, after the United States, Canada and the UK. • There are currently 90 weekly flights between Mexico and Colombia via Aeromexico, Interjet, Avianca, Copa, Wingo and LAN.